David, please accept my thanks to yourself and your delivery team! The event was a success, amongst 900 employees across the UK, we had a target of 5012 Miles to get us to Russia for the World Cup…we managed to clock 6600 Miles!! Thank you again for accommodating us and having the bikes delivered/ collected on time! Great working with you again. My wife and I want to thank you for your excellent customer support with our various treadmills over the past few several years. We are grateful for all of the help your team has given us, including carrying our first rent-to-buy treadmill up the stairs, helping us fish out our kids’ toys from within the motor housing, and most recently providing excellent customer care when we had a significant maintenance issue with our belt drive. I admit that I was nervous when my wife first suggested in 2012 that we look to purchase a treadmill, but am very happy that she selected the supportive, communicative team at Hire Fitness to be our equipment provider. Great to still be with you in 2017! Thanks to Paul and his team for providing such a high quality of service from beginning to end of our project. Thanks for everything..........Covering the health and safety aspects that were important to us and Hire Fitness conducted a top quality risk analysis allowing us to install a gym in our corporate headquarters for our product launch. The equipment was top quality and the day was engaging for our employees and clients, giving them the opportunity to think differently about our brand. I would like to thank you for hiring me the Synergy Elliptical. It has given me a great start to my new healthier living and kept me motivated. I found the machine easy to use and not all Intimidating, I also would like to commend you on the efficient service you provide and thought the machine was excellent value for money. I will certainly have no hesitation in recommending you and you would be my first choice if I need to hire equipment again. I just wanted to take this opportunity to thank you very much. Your levels of service throughout the hire and purchase of the treadmill were excellent and appreciated the extra support and advice you gave us. Hire Fitness provided us with a treadmill for the whole month of Ramadan. The machine was used for our live TV appeals and was used for extended periods and it never let us down. Service-wise Hire Fitness cannot be faulted, promptly delivered and picked up with friendly and helpful staff on every level. Thank you Hire Fitness - I completed my fitness challenge by running the marathon this year! I was delighted with my treadmill at home as it meant I was able to continue my training inside despite the dreadful weather outside! I'll definitely be in touch when I decide what my next challenge will be! Thanks guys - great service all round. Just wanted to say a big thank you to Hire Fitness for providing such a great service. They delivered when they said they would and collected promptly. Can't fault the service and the fitness equipment was great quality. Would recommend. I am delighted with my cross-trainer and have been using it every day since I got it! Even just 5 minutes a day is making a difference to my overall fitness. The cross-trainer is easy to use and I think it's very good value for money. So much so that I've now cancelled my gym membership and will now just hire when I want to! Thank you. I would like to say how pleased I was with my experience with Hire Fitness. The staff are friendly and helpful and did everything they could to accommodate me. In the end I found a time I could be at home so they could deliver my rowing machine and they delivered on time without any hassle. Excellent service guys, thanks so much. "I would like to thank the hire fitness team for helping me get in shape for my wedding" From the second I phoned them to order a treadmill they couldn't have done enough to help me. The machine was delivered within a day and set up for me in garage. They gave my a manual with the machine but also showed me how to use it and gave me advice on how to train to lose as much weight as possible for my big day. I loved the machine but miss not having it anymore. I will definitely hire again. I just wanted to congratulate Hire Fitness for an excellent service. I hired a Vibration Plate for 8 weeks and then bough it off them. They price was cheaper than the well known brand I'd seen in a big department but looks better and is more powerful. I would definitely recommend them to my friends-Thank you. Thank you hire fitness for your excellent service and great cross trainer. It really got me out of a sticky situation while the kids were on school holidays and I couldn't get to the gym. Thanks for the swift and excellent service provided for my Crosstrainer Hire. Nat Portsmouth. Great service and fantastic Fitness Equipment. Loved the Vibration Plate so much we decided to buy it. After sales service was also superb. Thanks for the Power Plate Hire. The great thing about when you Hire with Hire Fitness South Central is the Free Fitness advice Matt gives you on delivery, as he's a Fully Qualified Fitness Instructor. "Hiring the Synergy Elliptical Crosstrainer was superb. It has helped increase my motivation and energy levels. I found the machine really easy to use and it has made a real difference in losing weight after the birth of my daughter. l have already recommended your services to a number of my close friends." "I got great use from the Activ8 Treadmill hire. It was really easy to use. It was great that it folded up when not in use. I would highly recommend your company for its fast, efficeint and helpful service. We found there prices good value and there flexibillity and customer service has convinced me to use them again if the need arises." Thanks for a swift service for my treadmill hire in Southampton. The Treadmill was great quality and really sturdy. We hired the Power Plate for 16 weeks in Winchester and got some brilliant results. Thanks we wil hire a Vibration Plate again next year. I found the Cavisculpt easy to use and it has produced some results which I am pleased about and I have recommended it to friends. I originally hired a treadmill but after two attempts decided it was not for me. Hire Fitness were totally happy to change it and delivered a cross trainer within two days. The service was great, the machine was just as advertised and I will be back next year. Thank you so much Michael - this was a very good experience from start to finish and I will certainly recommend to my friends, I just wish our house was big enough to have one permanently!! 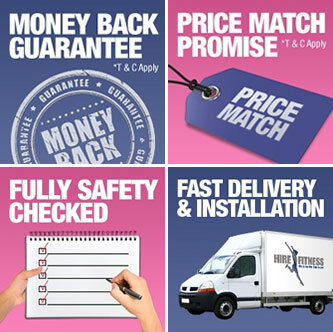 After some research on line,I decided on Hire Fitness for my treadmill.From initial contact to handing back the machine the whole process has been hassle free.When a very minor fault developed I had a brand new replacement delivered the very next day after the matter was reported.Now that is service!! We will be back in the future. Hire Fitness offered a prompt, courteous and comprehensive service supplying an affordable and good quality durable piece of kit. We would have no hesitation in using the company again. Michael is easy to deal with,courteous,punctual and trustworthy. Iwas searching for an exercise bike to be delivered and installed at my parents home and I am very happy with the service Michael Wall of Hire Fitness provided.I would recommend them to friends. After 12 weeks use of the Pro Plate, I felt in much better shape with noticeable improvement in the toning of my tummy,bottom and legs.I haven't felt so good for as long as I can remember. Thank you so much !! I want to thank you for your help and great flexibility. As you know i had a 'brain attack'(stroke) in late 2007 and had to learn to walk again. The hire of the walking and cycling machines have been brilliant in helping me to walk again. Last week my wife and I walked half a mile on the South Downs Way, no mean feat for me! Thanks for all your help, professionalism and kindness. The Croma Green Treadmill I hired for my green screen studio shoot was great,it easily keyed out in post with no problems. A great service from Hire Fitness-highly recommended! Hire Fitness delivered the Cross Trainer within one hour of my phonecall.I couldn't have asked for much more than that and it was a brand new machine!! Superb service and an impressive piece of equipment. What a great company. Before I contacted Hire Fitness,I was not feeling good about myself,and was rather overweight.I am really busy and don't have time to go to the gym.I hired 3 pieces of equipment for 3 months and Michael kindly threw in the rower for free.It has been hard work but really satisfying to lose weight and to have a new outlook on life.Even my wife says that she quite fancies me, so that can't be bad ! Thank you Hire Fitness,you are to be recommended.